In the Walker family we have these two framed samplers which are full of genealogy information. J.J. – M.Y. – M.J. – T.J. – J.J. – I.J. – J.J. – C.J. 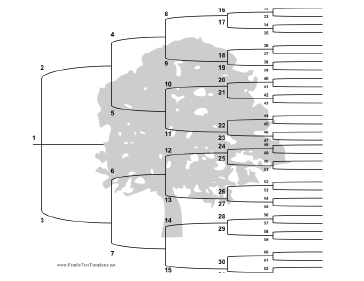 For further details of the above, please see the JOHNSTON family tree. Here (right) is one of two photos I have of an adult Margaret JOHNSTON (I also have one of her husband, James WALKER, from the same date). The date of this photo is unknown, but I guess about 1848. The name and address of the photographer, on the reverse, suggests a date between 1848 and 1865. Note; the letter “J” might alternatively be an “I“. I have transcribed it as a “J” because that is what fits with the matching records I’ve found; see below. A.Y. = Alexander YOUNG, chr. 04/02/1774, Ecclesmachan, West Lothian. J.Y. = John YOUNG, chr. 09/01/1776, Ecclesmachan, West Lothian. d. 13/10/1844. M.Y. = Mary YOUNG, chr. 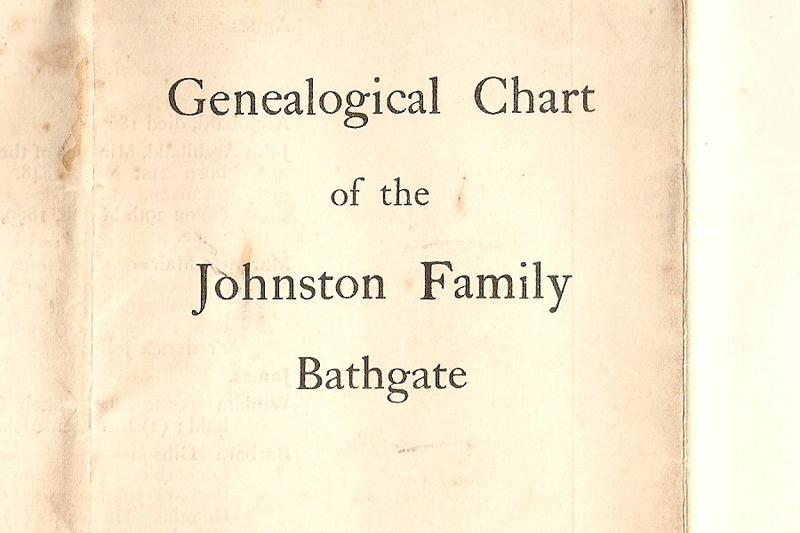 11/12/1777, Ecclesmachan, West Lothian. d. 04/06/1845. A.Y. = Alexander YOUNG, chr. 23/02/1780, Ecclesmachan, West Lothian. d. 18/12/1805. T.Y. = Thomas YOUNG, chr. 24/01/1783, Ecclesmachan, West Lothian. d. 27/12/1811. J.Y. = James YOUNG, chr. 06/06/1785, Ecclesmachan, West Lothian. William YOUNG, chr. 18/04/1788, Ecclesmachan, West Lothian. Charles YOUNG, chr. 09/09/1790, Ecclesmachan, West Lothian. d. 05/07/1844. Robert YOUNG, chr. 07/06/1796, Ecclesmachan, West Lothian. d. ? (an infant). 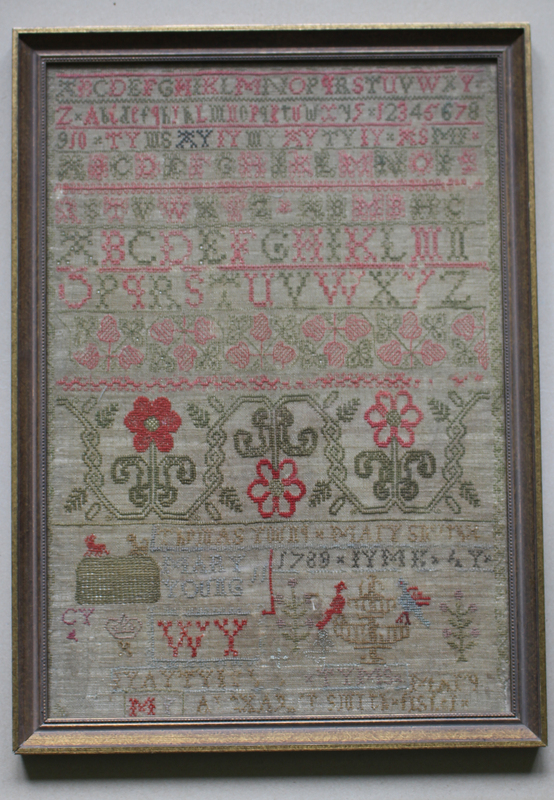 The bottom third of the sampler begins clearly with the parents’ names; THOMAS YOUNG and MARY SMITH, then the name MARY YOUNG (who’s handywork I believe this sampler is), and a year; 1789, which presumably represents a completion point for this sampler. 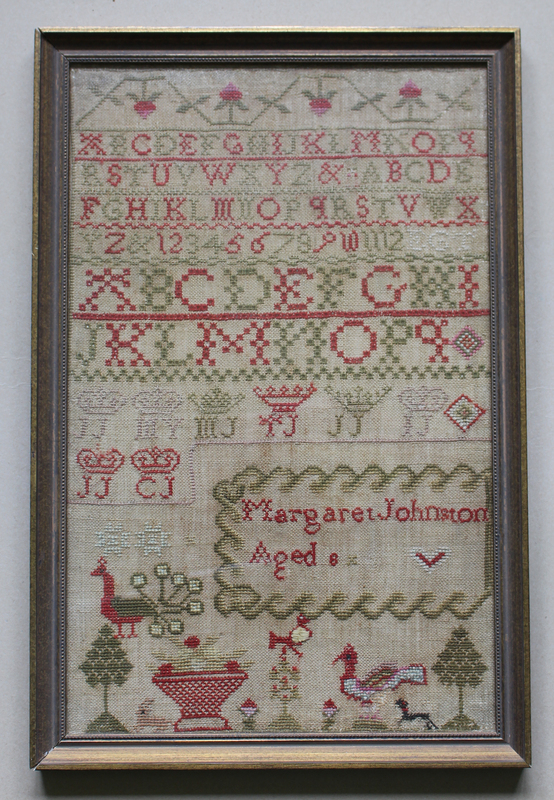 The very bottom row appears to name the maternal grandparents; ALEXANDER SMITH and MARY FISHER. 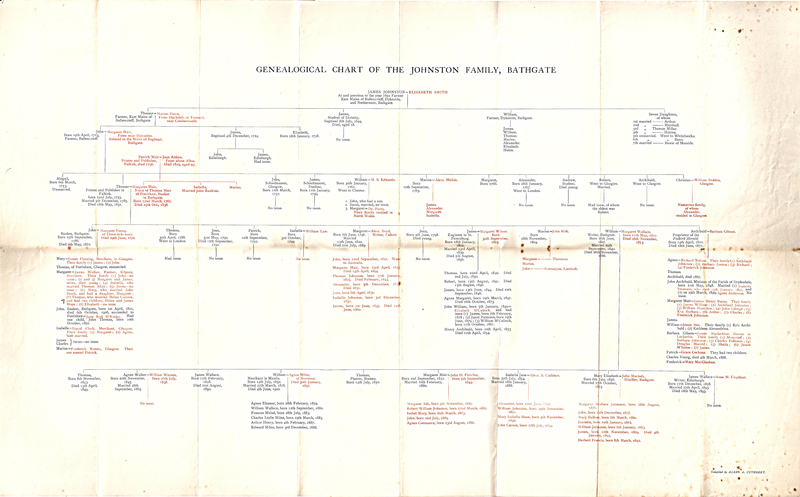 If you could shed any more light on these families and their relations, perhaps through other original family documents, please leave a comment below or use the Contact Page to get in touch. Thanks.